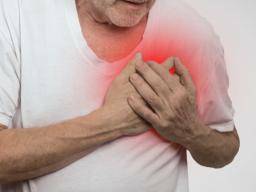 Most people are familiar with left-sided chest pain and how it can indicate serious heart problems, such as a heart attack or other heart diseases. Right-sided chest pain is not usually talked about as often, but can still indicate a variety of problems. Pain in the right side of the chest can result from direct injury or inflammation of certain structures, or by referred pain. Referred pain is when pain originates in a different part of the body. Right-sided chest pain can be caused by many different conditions, illnesses, and injuries. Here are 17 potential causes. There are a number of different causes for right-sided chest pain, including anxiety, trauma, rib fracture, and heartburn. Severe anxiety or stress can trigger an anxiety attack. In some people, an anxiety attack has many of the same symptoms of a heart attack, including chest pain, dizziness, heart palpitations, and difficulty breathing. An anxiety attack can be caused by a stressful event or may occur randomly. As many of the symptoms are similar to a heart attack, it is crucial for anyone who is uncertain about their symptoms to seek medical attention. The chest wall is made up of many different muscles. It is very easy to strain or sprain these muscles by increased exercise or activity, or from stress or tension. This type of chest pain, though it can be uncomfortable, is easily resolved with rest and over-the-counter pain relievers. A traumatic injury, such as from a fall, a sharp blow to the chest, or a motor vehicle accident, can damage the nerves, blood vessels, and muscles within the chest. It is also possible to damage the heart, lungs, or other internal organs with this kind of an injury. Anyone who has an accident like this should call the doctor or emergency services, as internal injuries are not always apparent. Costochondritis is an inflammation of the cartilage that connects the ribs to the main breastbone in the front of the chest. The pain from costochondritis may be severe and can be caused by intense coughing, infection, or traumatic injury. Costochondritis usually goes away on its own, but people may need extra rest, pain relievers, and hot or cold compresses to aid recovery. A doctor will need to examine a rib fracture. A rib fracture is a break in the bones that protect the internal organs in the chest. It can be very painful and can lead to serious complications if not treated correctly. Rib fractures are usually caused by a fall or impact to the chest but can also be caused by severe coughing. If the break is on the right side, it can cause pain, swelling, and tenderness in that area. A pneumothorax or collapsed lung occurs when air escapes from the lung and gets into the space between the lung and the chest wall. This makes it difficult for the lung to expand when breathing and can cause sudden and significant pain or discomfort. Someone with this condition would also experience a shortness of breath, a rapid heartbeat, and dizziness. They may even collapse suddenly. Pleurisy is an inflammation of the membranes that surround the lungs. This inflammation causes friction between these two layers of tissue, which can cause sharp and severe pain when breathing. Usually, there is a thin fluid-filled space in between the lining of the lungs and the lining of the chest cavity. As someone breathes in and out, the lungs can glide over this tissue smoothly. A pleural effusion is the buildup of fluid in between the layers of tissue outside of the lungs. It can cause chest pain and shortness of breath. Breathing may get more difficult over time, so it is essential to see a doctor. Pneumonia is an infection of the lungs. It can be caused by many different bacterial, viral, and fungal organisms. People with pneumonia often experience chest pain when breathing and coughing. Other symptoms of pneumonia include fever, chills, a cough, and loss of appetite. Pulmonary hypertension is a condition that causes high blood pressure in the blood vessels that connect the heart and lungs. Over time, this makes the heart work harder to pump blood throughout the body and can cause chest pain. Pulmonary embolism is a blood clot that has become lodged in the lungs. It can be life-threatening if not treated quickly. If it occurs in the right lung, it can cause right-sided chest pain. Additional symptoms include shortness of breath, rapid breathing, and coughing up blood. The pain and other symptoms of pulmonary embolism usually come on suddenly and require emergency medical attention. What’s to know about pulmonary embolism? Pulmonary embolism affects around 1 in 1,000 people in the United States every year. Learn more. Lung cancer causes chest pain, coughing, and shortness of breath as the growth starts to interfere with the normal functioning of the lungs. Growths within the chest or chest wall, whether or not they are cancerous, can also cause chest pain. As the tumor grows, it will put pressure on the nerves or blood vessels that are nearby, causing pain or discomfort. While most people associate left-sided chest pain with a heart attack or other heart ailment, right sided pain is also possible, especially if heart disease affects the right side of the heart. The virus that causes chickenpox also causes shingles. Someone with this condition has inflammation of a section of nerves as well as the skin and structures surrounding them. If the affected nerves are in the chest, it can cause chest pain. Shingles tends only to affect one side of the body. At first, shingles may cause pain and sensitivity in one area, as well as a fever. It will later develop into a painful, itchy rash. Heartburn is caused by stomach acid that has passed back up into the food pipe from the stomach. The food pipe is located within the chest, so it can cause chest pain that seems to come from the right side. These structures play a vital role in normal digestion and have other essential functions. They are located in the top of the right side of the abdomen. Gallstones, pancreatitis, and liver disease are just a few of the conditions that can cause referred pain in the right side of the chest. Any chest pain should be reported to a doctor as soon as possible. Whenever someone is experiencing chest pain, regardless of the location within the chest, they should mention it to their doctor promptly. While there are many explanations for right-sided chest pain that are not an emergency, there are some medical conditions that require urgent care. Previous post What is a yeast allergy?